Amidst lots of puff & bluster, Microsoft has released a half decent Beta version of its latest Windows 7 operating system. One of the claims made for it is that it is faster than Vista. Mind you, it needed to be. I dumped Windows nearly two years ago, largely because of the slug-like performance of Windows Vista. 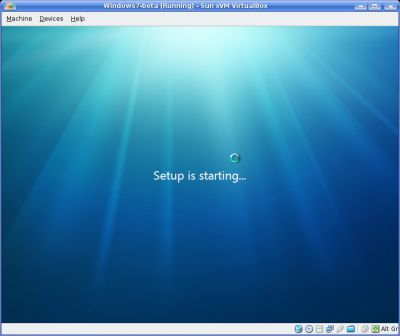 Well, last night, I managed to install a beta version of Windows 7 (build 7000 32-bit) on a virtual machine. Basically I used Sun VirtualBox running on Kubuntu Linux 8.04-1. I created the same sized virtual machine upon which I have successfully run Windows XP for some time. Despite being offered such a friendly environment, it took over an hour to install, which is much longer than XP in the same environment. Screengrab of installation early stages. Note Windows 7 is running in a VirtualBox virtual Machine on Kubuntu Linux. Interestingly, at the same time I started to install Windows 7, without any additional applications, My g/f installed Goosebuntu (Kubuntu Linux c/w all the office, multimedia, programming, educational and internet application she needs) on a very humble, 2-year-old IBM Lenovo Laptop. She had her system up and running c/w all apps in less than twenty minutes. That is less than 1/3 the time it took me to install a bare-bones Windows 7. It takes the best part of an hour before you see this for the first time! 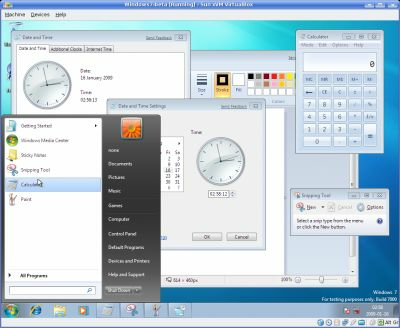 Once installed, Windows 7 runs a little slower than XP given the same resources. But it is much quicker than Vista. Interestingly all the widgets that appear on Vista are by default switched off in Windows 7 - so the sceptic in me suspects that is how MS has achieved much of this speed improvement. I'm unable to comment on the Windows 7 driver situation because VirtualBox provides Windows with an environment that is fully supported natively by the Windows Driver Model and hence needs no additional drivers for things like ethernet, graphics & sound cards etc. VirtualBox pretends these cards are all something really easy for Windows to handle. Actually if you like Linux but you need to run Windows for Photoshop etc. then a virtual machine on a decent Linux box makes life amazingly easy, in my experience! And of course, you only need an old (and fast) version of Windows that is just good enough to run the legacy app of your choice, because all the clever stuff is managed by Linux. Anyway, back to the plot. All-in-all Windows 7 seems a pretty usable OS, and at least it works on a reasonably-resourced machine, unlike Vista. And it seems pretty stable too. So Windows users who have stuck with XP and avoided Vista will probably rather like Windows version 7. However, having enjoyed the power, stability, rapid installation, zero cost and long up-times of Kubuntu, I somehow doubt that I'll be splashing out Windows 7 when the beta expires at the end of July! I have still not actually installed any serious applications on Windows 7 yet. Again I will report back if/when I have. Windows & with a few built-in applets running. Note Windows 7 is running in a VirtualBox MV running on Kubuntu Linux. I have taken a number of other full-sized screen grabs of what I've seen so far, that some of you may find helpful. Though please note they are "surrounded" by a Kubuntu Linux window for reasons outlined above. Fortunately, my test version of Windows 7 resides in the relative safety of a Linux virtual machine (VM). This VM is the electronic equivalent of a padded cell that can isolate guest operating systems from the Internet and pen drives - thus preventing Windows from hurting itself! But I haven't had time to research this latest Windows malware. Therefore folks planning to test Windows 7 beta on a live box might want to do some further reading first.